The 2019 football season is really starting to rev up and with two rounds of the Allianz League under the belt the narratives for the campaign are beginning to play out. Already there are a few young players who have stood out above the rest and look set to leave a serious mark on the game this year. Here, RTÉ Sport takes a look at just a few of those rising stars who are blazing a trail even on the soft, mucky fields of an Irish springtime. Costello isn’t exactly an unknown to football fans, he has been tipped for the top since he was a minor first in 2011, but he has still yet to consistently deliver for Dublin. Maybe 2019 is his year. He played the full 70 minutes – a rarity for the Whitehall man – at centre-forward against Galway at Croke Park last weekend, pulling the strings and scoring 0-6, five from play and one from a mark. He’s still only 24, and has never started a senior All-Ireland final, so his best years are ahead of him and given his experience he can be the new player that manager Jim Gavin drops into his team every year to keep things fresh. Fun fact; he played in five All-Ireland finals as a minor with Dublin – losing hurling and football in 2011, hurling after a replay in ’12 and finally getting his hands on a winners’ medal in football in ’12. Last year’s Under-20 Player of the Year has started his senior career with Kildare as could have been expected. Having picked up an All-Ireland medal with the underage Lilywhites in 2018 he has been impressive in two Division 2 games, scoring 0-4, including the levelling free, against Armagh and a point from a mark against Cork the last day out. 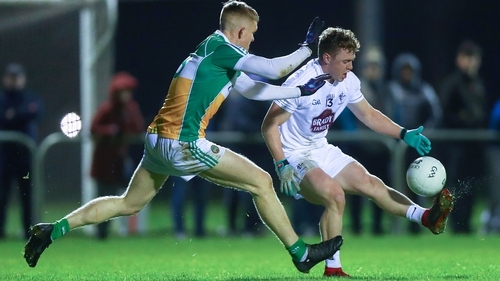 Daniel Flynn has decided to step away from the Kildare panel this year, which leaves them without a serious footballer up front, but Hyland certainly can go a long way to plugging that gap. He scored 0-08 against Dublin in last year’s Under-20 Leinster final, put 1-08 on Kerry in the All-Ireland semi-final and notched 0-10, eight from play, in the decider win over Mayo. In his second spell as Mayo manager James Horan has drafted in a number of promising young talent, with 2016 All-Ireland Under-21 winner Michael Plunkett and Ryan O’Donoghue, who was last year’s Under-20 captain, among those tipped to impress. But the man who has stood out so far is forward Fionn McDonagh, who was part of the Westport side that won the All-Ireland intermediate club title in 2017. He picked off 1-03, all from play, in his first competitive start for Mayo against Tyrone at Healy Park and his scoring wasn’t the only eye-catching element of his display. Like any good modern forward, he tracked back and tackled hard when his team hadn’t got the ball and then was always available to take the pass when the Green Above the Red were on the move forward. The 20-year-old former Ireland underage basketball international has made quite an impact during two substitute appearances for Monaghan so far this season – his first action with Malachy O’Rourke’s senior team. Within seconds of his introduction against All-Ireland champions Dublin on the first day of the new season he bagged himself a goal as Monaghan scored their second successive League win over the Dubs. Then he managed to get himself sent off following an off-the-ball incident against Roscommon last weekend. That will result in an automatic one-game ban for the Carrickmacross man, but he will still remain very much part of the O’Rourke’s plans. O’Hanlon took a basketball scholarship and finished his schooling in New York and is now back in the country studying at NUI Maynooth. Given that his time in America limited the amount of football he played, his progress has been impressive. Leitrim are the team with the best League record in the country, sitting atop Division 4 with two wins from two and a scoring difference of +17. Leading the charge for them has been 22-year-old Ryan O’Rourke, who has racked up a combined 2-10 in his outings so far against Wexford and Wicklow, scoring the winning goal in Aughrim last weekend late on despite being double-marked for much of the game. Despite his youth, he had the maturity to lead his club Fenagh to last year’s Leitrim intermediate title as captain, scoring 2-15 across the draw and the replayed final – that’s leadership as well as football quality. If his team are to maintain their promotion push out of the basement division they will be looking to O’Rourke to lead the way.